It's possible to add a new order via the manager as well. Click the Create a new order button and fill in the customer address. 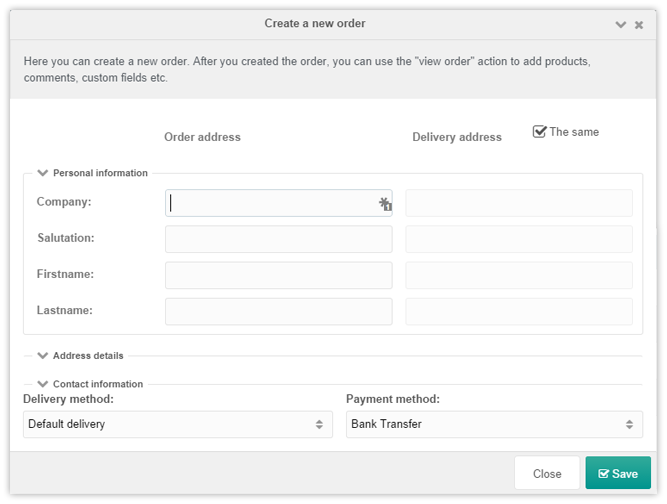 Save the order (it will be created as a draft), and view the order details again to add products, order fields and more. As you can see in the above screenshot you can also determine the delivery and payment method. After you have added the new order you have the ability to view details as usual and add products, custom fields and comments. By binding the order to the right account, you customer can find the new order in the My Orders section.